Is there anything for cyclists in John Street plan? The proposal for the "pedestrianization" of the John Street "Cultural Corridor" remake has been finalized and will be voted on by the Public Works and Infrastructure Committee meeting this Thursday Feb 16 and then on to City Council. There are no bike lanes in the proposal despite John Street being a quite popular connection for cyclists to and from downtown. It seems to me that some kind of bike lanes - out of pain or decorative bricks could have been an easily accommodated while still allowing for a much improve pedestrian realm. The John Street plan looks quite nice. I look forward to seeing it completed. It's laudable that a downtown street will be made more livable by making motor vehicles less dominant. It's an important demonstration of moving away from fetishizing the private automobile, and towards a built environment friendlier to active transportation. But along the way the plan has devalued the role of cycling in creating a vibrant city. this reconfiguration. It was concluded, however, that with the recognition by City Council of John Street as a pedestrian priority route and the direction to enhance the pedestrian realm accordingly, the provision of bike lanes was not consistent with this direction. Furthermore, with the other transportation initiatives soon to be underway in this area, specifically the Downtown Transportation Operations Study and the Richmond/Adelaide Separated Bikeway Environmental Assessment Study, opportunities to improve cycling connections in this area on routes other than John Street will be developed. The report says bike lanes would "reduce opportunities" to expand sidewalks, which I think would be best interpreted as "we didn't want to compromise our plan". By installing bike lanes the sidewalks wouldn't be quite as wide. The measurements made by Dave Meslin showed that John Street south of Queen was plenty wide to accommodate both wider sidewalks and bike lanes (from 1.2 to 3.8m). 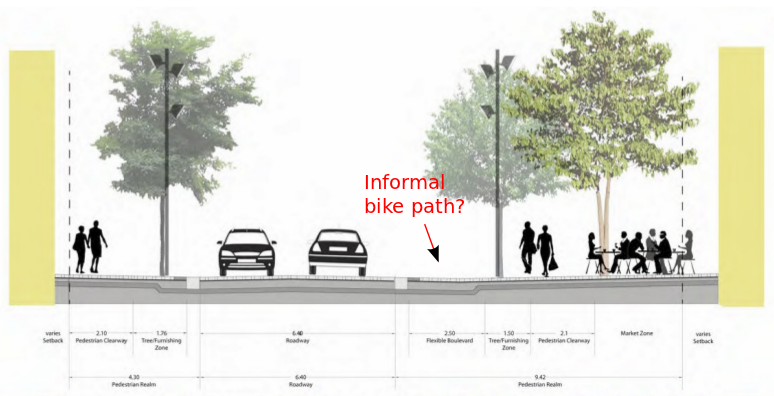 In the absence of any objective criteria from the planners on what is the ideal sidewalk width, it's not clear how they can outright exclude bike lanes as an option. "Reducing opportunities" is not a good enough reason for waving aside the Toronto Official Plan which "states that an effort must be made to make all streets more bicycle friendly", notes planner Christian Chan in his submission to PWIC. "One of the provisions of the 2000 “Toronto at a Crossroads” Report and the Waterfront Plan is that traffic engineering and street design should encourage walking and cycling." I strongly believe that a thorough assessment of the opportunity to include provisions for proper cycling infrastructure was not conducted, and the Study should not be considered completed until there is sufficient evidence presented by staff to support their position. Chan suggested a simple designs that would help accommodate cyclists who will continue to use this key cycling route: "It has been established in the downtown pedestrian zones of Copenhagen, which shares many of the same features of the proposed pedestrian designs for John Street, that a simple surface texture change can guide the division of pedestrian traffic from cycling traffic in the proposed corridor." (A Toronto example of a textured bike lane would be the bike lane along St. George north of Wilcocks). I'm curious to see how cyclists will use John Street as imagined in this plan. In particular I am curious to see how cyclists will treat the unique space on the eastern side of the street called a "flexible boulevard". Will cyclists know that the planners meant it to extend the "pedestrian realm" and provide space for the "occasional delivery vehicle"? Or will they end up just using it as an informal bike path? And do the cyclists know that the "mountable curb" is there just for "emergencies"? I guess we'll see. Given the intentional permeability of the pedestrian and vehicular realms that we shouldn't be too surprised when cyclists start to filter more often into the pedestrian realm, particularly when there is no defined space for cyclists. It's a popular key route for cyclists to get to and from downtown. In order to be accessible cycling routes need to be comfortable for a wide range of abilities and ages. Bike lanes, and in particular separated bike lanes, provide a measure of safety (particularly on major arterial roads). Bike lanes help to keep drivers from drifting and blocking the space next to the curb where cyclists normally ride, thus making cycling faster on congested streets. The report states "Although bike lanes are not included in the recommended design, with the narrowing of the pavement and the resulting calming of traffic, conditions for cyclists could arguably be better than the current situation." They are probably correct, though it doesn't address one of the biggest benefits of using cycling as an efficient mode of transportation: many more people can move through a smaller corridor by bike than by car. If John Street is clogged with cars it negates that benefit. I've often noticed on downtown streets with narrow lanes that cyclists can easily get stuck behind long lines of cars where if we just had a bike lane we'd easily beat all the cars. The provision of urban design elements which consist of a double row of trees where feasible, removable bollards, infrastructure to support special events and distinctive paving materials and patterns. For further details, see the January 25, 2012 staff report, which includes imagery of the recommended design on pages 16 and 17. Additional drawings and other detailed study materials are available on the project web page under "Get Involved"
The City of Toronto’s Public Works and Infrastructure Committee (PWIC) will be considering the outcome of this study at its February 16, 2012 meeting, item PW12.3 (moved from Feb 15 because of a special Council meeting). Sign up to depute at the PWIC meeting or leave your comments. What the John St. redesign needs (but is out of the project scope) is a teeny-tiny contra-flow connector on Stephanie between John and Beverly Sts. provide an alternative to the streetcar-track-and-parked-cars danger zone of McCaul. As far as I can tell, though, the project is ONLY looking at John, NOTHING ELSE. Dumb. Well my thinking is that if the street is already mostly pedestrianized, the motor traffic is likely to become slow enough and light enough that a cyclist shouldn't have too much trouble taking the lane in either direction. Once that happens, the city will probably have a good impetus to put contra-flow lanes on Simcoe between Front and Richmond and to get the separated bikeways installed on Richmond/Adelaide. Of course it'd be even nicer if the City were to construct a connection not on John (e.g. something in the vein of Stephanie/McCaul/Duncan at one end, and installing controflow lanes on Simcoe at the other--oh, and also to take down the Queen/John traffic lights in favour of lights where the new connection crosses Queen; if John's a cultural corridor rather than an artery, it probably won't need lights anyway.) Definitely nicer though if John's going to be closed frequently, as the existing design looks like it's meant to support. Every time designers, planners and politicians think bikes can fit in somehow without bike lanes, they should be forced to ride it first. This one and Front street @ Union Station. Plus all the suburban arterials. Then if the build it, they have to explain to every pedestian, upset by bikes on the sidewalk and every car driver, upset by bikes blocking them, why they thought this was a good idea. They can pay all the fines too. It is not my fault for riding a bike. It is not my fault there are no bike lanes. But I am the one who gets yelled at no matter where I ride. I expect this is will be experienced as a compromise by every type of user of John St (maybe not as much by pedestrians) and using it will require some give and take in terms of speed, direction and awareness. There isn't a lot of experience with shared streets in this city and cyclists may end up shifting to Peter, Duncan and Simcoe, where bike lanes would be welcome - maybe even on Nelson, Pearl and Widmer as well. "cyclists may end up shifting to Peter, Duncan and Simcoe"
How does an inexperienced cyclist travel to and from the downtown and the Beverley Street bicycle lanes using any of these streets. There is no stop light at Duncan and Queen Street West and there is no intersection or traffic light connecting the two streets. They are offset and both dead end at Queen Street West. McCaul is extremely narrow and has street car tracks. It is a very dangerous street for cyclists. Does a cyclist enter Queen Street West and turn left on the Queen Street car tracks to either of Duncan or McCaul. Peter Street is located west of Beverley. Any cyclist travelling to the downtown or the Lake via Simcoe has to go west and then east to backtrack if they are using Peter to or from Beverley. Who would do this? Secondly Peter and Soho both dead end at Queen Street West. Although there is a traffic light at Peter Street a cyclist has to enter Queen street traffic and make a left hand turn across oncoming traffic at the Peter Street intersection to cross the Queen street car tracks again to go to or from Peter Soho. There is no traffic light at Simcoe and Queen Street West and will not be because it is too close to University. To get to or from Simcoe from Beverley Street requires a cyclist to travel on a system of poorly lit and poorly maintained laneways behind the Queen Street West stores. Then a cyclist has to ride across the street two opposing traffic lanes without a light. Inexperienced cyclists will not do this. The lanes are called Renfrew Place and Pullan Place. To get from John Street east to Simcoe requires a cyclist to cross 3 north south streets. Some of the lane north south street intersections are blind because of no setbacks for buildings. Some the lanes are lined up either ie they jog. The City says it is going to study alternatives for cyclists to cross Queen Street West as part of a future study. All of the alternatives that I know of are outlined above and all of them are significantly worse, less convenient and less safe than John Street for cyclists to cross Queen Street West to get to and from Beverley and the downtown core or the Lake. The existing cycling commuter function of John Street was never seriously considered in the planning for John Street from the outset. I admit that I was not thinking of inexperienced cyclists specifically. I also did not assume that any north-south bike trip would necessarily involve the Beverley St lanes or the use of McCaul, because why would it? The John Street proposal is about the area between Queen and Front and not every trip is going to be between those exact two streets. Duncan is an option between King and Queen, both of which can be used by cyclists to connect to other streets north and south. Peter and Soho do need some kind of realignment, maybe a bike crossing signal or bike channel cut into the sidewalk. I believe someone once proposed something like that on this site. I currently take a southbound route that is Beverley - (Stephanie/Grange Park) - John - Nelson - Simcoe. If John were to become less convenient for cycling I would not have a problem taking Beverley - Queen - Nelson or Beverley - Queen - Peter, depending on where I was ultimately going. Renfrew and Pullan are problematic but could probably be reconfigured for bikes both ways, perhaps with car traffic restricted or removed. I don't have a problem with using the city's laneways and unmarked intersections - they just require a little more caution, and intersections such as Queen/Simcoe are actually manageable because the signals at University control the traffic flow across Queen. Wildly off-topic, but another spot that could use a short contraflow lane is on Charles between St. Nicholas and Balmuto. It's right next to the manulife center and that U of T housing building. (Map) As-is I don't feel terrifically bad making an unauthorized left turn if I'm feeling like taking the quiet back streets instead of Yonge. It would be pretty awesome though if we could do this and feel legit. Maybe I will contact the local councillor about it some day. I don't really think it's all that off-topic! It's one thing to acknowledge that some of our major streets aren't cycling-friendly but taking the quieter side streets has to be made a better option. The city is full of these little inconveniences and addressing them goes a long way in the absence of progress on the bike lanes issue. They SHOULD make bike lanes. They SHOULD make bike lanes. One condition though... fines for breaking the rules of the road are increased by about 100:1. We need more bike lanes, but be serious: if it's a pedestrian-focused throughfare, then those on bikes need to be extra mindful that people will be walking along without a care in the world. ie: No cutting up onto the sidewalk to make a shortcut, and no running reds intentionally. While there are plenty of idiots driving cars, most do typically tend to avoid doing such things. A bit more-so than cyclists. Hey Mondesi, why don't we do the same to car drivers! If cars want to drive over 30 km/h then fines for breaking the rules of the road are increased by 100:1. You don't want to make things safer for pedestrians, Mondesi, you're just angry at cyclists and want to take revenge. If you genuinely had concern for pedestrians you'd take a hard look at the actual numbers of pedestrian injuries and fatalities and conclude that the vast majority are caused by people in cars. There is something very similar in Vancouver. There's a bridge over some railway tracks on Hastings. The sidewalks are very wide on this bridge and there's a line of light poles about a third of the way across. What people biking tend to do is instead of being on the street (which is fast moving) they ride on this bit of sidewalk between the poles and the street. People rarely walk there as they have so much room to walk farther from the cars. I see that happening in this case except there might be a problem with people walking between the poles and the road. My experience has been that there needs to be some separation between walking and cycling. This is especially true in a tourist place or where people are distracted by the sights. They wander wherever without realizing there's a throughway. So not to blame anyone in any mode, we should really blame the design. In London, England there's now talk of suing the city for those killed by the bad design of the roads. For John Street there better be somewhere else to go very close or people will just cycle through it anyway.